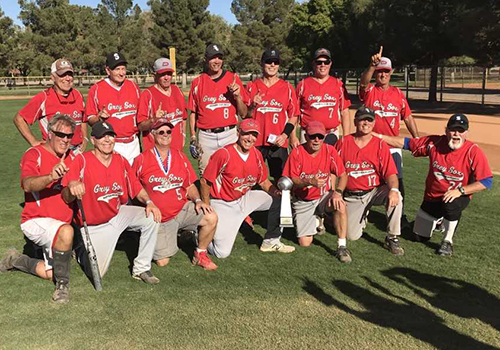 LAS VEGAS – The elder statesmen of Senior Softball took the field, Sept. 24 – 27, with the Men’s 65 through 85 age divisions competing for the top prize in the sport. A total of 144 teams played across 14 age divisions. Starting with the five-team Men’s 65 Major Plus Division, top seed Timberworks/Adidas (CA) avenged their lone loss of the week against the Rebels (CA), 36-28, in the championship game, with a convincing 42-27 victory in the “if” game. 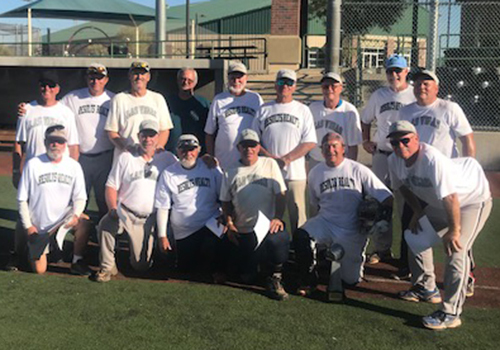 Timberworks also defeated Team Florida, 33-22, in the US National Championship game en route to securing its second straight Triple Grand Slam title. Rebels fell to Timberworks, 29-25, earlier in the bracket to fall into the elimination side of the bracket. The team would go on to win four straight games, including the championship game to force the “if” game, before running out of gas en route to their runner up finish. New Jersey Hitmen finished in third place, while Team Florida finished fourth. In the 20-team Men’s 65 Major Division, Carolina Cobras (NC) entered bracket play as the top seed, winning the US National Championship game, 23-9, over No Dice/Bay Photo Lab (CA). The team would be unable to complete the Triple Grand Slam, as Carolina Cobras went on to place third following a 3-2 record in bracket play. During opening ceremonies, No Dice/Bay Photo Lab was awarded with the 2018 Steve Simmons Memorial Team Sportsmanship Award. Enviro-Vac Maruader (BC, Canada), the No. 3 seed in the bracket, polished off a perfect week going 2-0 in seeding play and 5-0 in bracket play, including a thrilling walk-off, 22-21, win over Handeland Flooring (WI) in the championship game. Trailing 21-20 heading into the bottom of the open, Enviro-Vac Maruder got the two runs it needed connecting on a pair of homeruns. Rick Parker, 66, of BC, Canada, got the ball rolling connecting on the game-tying homerun with one out. Two batters later with two outs, Ralph Tipton, 66, of WA, did his best Joe Carter impersonation, touching them all with the game-winning solo homerun. Dropping down in to the elimination side of the bracket following a 25-23 loss against Carolina Cobras, Handeland Flooring rattled off three straight win-or-go-home games en route to their runner-up finish. Top Gun 65 Mavericks (CA) rounded out the top four finishers. After dropping their opening game in the bracket, 21-19, against Animals (CA), Top Gun Mavericks rattled off a remarkable six-game winning streak in the elimination side of the bracket before running out of steam in the fourth-place game against Handeland. In the 27-team Men’s 65 AAA Division, the largest division of the second session, hometown team Rezults Realty (NV) benefited from its home field advantage, going 2-0 in seeding play, before rolling six straight wins in bracket play, including a 33-13 victory over Rocco’s OTD (AZ) in the championship game, to cap off an unbeaten week. After going 0-2 in seeding play, Rocco’s OTD bounced back with a 5-2 record in bracket play en route to their runner-up finish. Dallas Spurs (TX) also bounced back from an 0-2 showing in seeding play, to rebound with a 6-2 record in bracket play, including four straight wins in the elimination side of the bracket, to eventually finish in third place. Sidewinders Desert, the US National Champion, finished short of completing the Triple Grand Slam, rounding out the top four finishers. The team went 4-2 in the bracket. 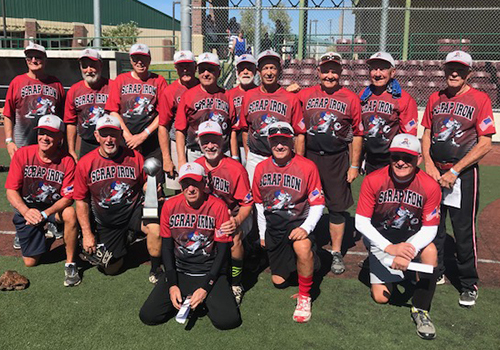 In the 15-team Men’s 65 AA Division, Gray Sox (WA) posted a perfect 5-0 record in bracket play, including a 30-17 win over Blue Chips (IL) in the championship game. After dropping their second game in the bracket, Blue Chips fell into the elimination side, where the team rattled off five straight wins, before running out of gas in the championship game. Relentless (TX) finished in third place, while Duke City Dynamite (NM) finished fourth. The four-team Men’s 70 Major Plus Division saw the second Triple Grand Slam of the second session completed, as Venom (FL) knocked off Omen (CA), 28-27, in a thrilling US National Championship game, before going 3-0 in bracket play, including a 24-9 win over Sons of Pitches (CA) in the championship game. For Venom, this marks the second straight Triple Grand Slam for the team. In the US National Championship game, Venom entered the bottom of the open trailing 27-24. Venom would go on to plate the four runs it needed to complete the second stage of the Triple Grand Slam and enter bracket play as the top seed. SoCal Gusto (CA) finished in third place. Minnesota P5/Ancell captured the 16-team Men’s 70 Major Division, as the team completed a perfect week, going 2-0 in seeding play, before posting a 5-0 record in bracket play, including an 11-8 win over Poncho’s (AZ) in the championship game. Nor-Cal STIXX (CA), who entered the tournament as the US National Champion, fell short of the Triple Grand Slam, finishing third. The team started off slow, going 0-2 in seeding play and falling in their opening bracket game against eventual winner, MN P5/Ancell, 20-19. The team regrouped in the elimination side of the bracket, winning six straight games, before running out of steam in the third-place game against Poncho’s, 13-8. Tri-State Diamondbacks (NM) rounded out the top four finishers. 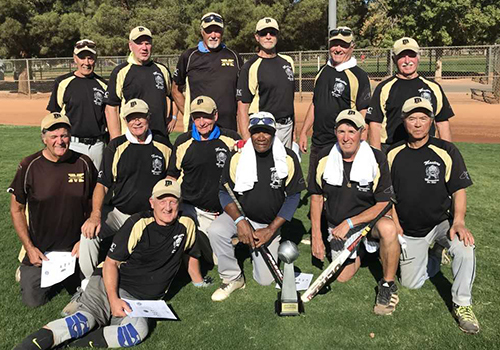 The 13-team Men’s 70 AAA Division would see a second team from North of the Border capture a World Masters Championship during Session #2, as top seed Masters Marauders (BC, Canada) completed an undefeated week, going 2-0 in seeding play and 4-0 in bracket paly, including a 25-24 walk-off win over US National Champion, Sacramento Islanders (CA), in the championship game. Masters Marauders plated three runs in the bottom of the open to complete the walk-off win in the championship game. Sacramento Islanders fell just short of its quest for the Triple Grand Slam. Without a team to play in the US National Championship game from the East, Sacramento Islanders were the default US Champion. MN Lumberjacks finished in third place, while Top Gun Patriots (CA) finished fourth. The five-team Men’s 70 AA Division would see the championship come down to the “if” game, as top seeded Chicago Hitmen (IL) downed No. 2 seeded El Paso Nine Elevens (TX), 21-9, in the winner-take-all game. Chicago Hitmen also defeated El Paso Nine Elevens in the championship game, 14-8, to force the “if” game. Chicago Hitmen dropped their opening game of the bracket, 14-13, against US National Champion, Triple Play (CA), to fall into the elimination side of the bracket. Chicago Hitmen would go on to roll off five straight wins, including the double-dip of El Paso Nine Elevens, to win the division. Triple Play finished third, while Doughboys (NV) finished fourth. 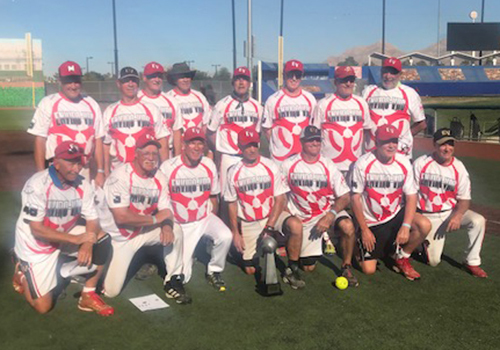 The four-team Men’s 75 Major Plus Division saw Scrap Iron Legacy (CO) defeat US National Champion and top seed, Omen (CA), 14-9, in the championship game. General Equipment (OR) finished third, while San Francisco Seals (CA) rounded out the four-team division. 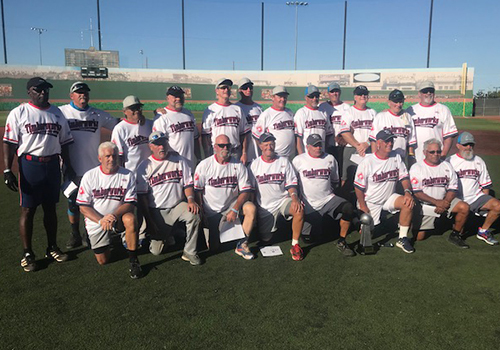 In the 10-team Men’s 75 Major Division, which was split between the American and National pods, California Connection defeated State Roofing System (CA), 29-14, in the championship game. California Connection knocked off Scrap Iron Beams (CO), W.E. Ruth Realty (WA), and Findlay Scorpions (AZ) to reach the championship game; while State Roofing System defeated Sidewinders (AZ) and Hooters/Ginco/Bryce Orthopedics (AZ) to advance to the championship game. State Roofing System entered the tournament as the default US National Champion with no opponent from the East to play. The champion of the seven-team Men’s 75 AAA Division was determined by a full six-game round robin. With a perfect 6-0 mark, ProHealth Care (WI) took the top spot. Git-R-Done (CA) and Stark Street Pizza S.CA (CA) tied for second with an identical 4-2 record. Git-R-Done earned the tie-breaker via its 16-13 head-to-head victory. Arizona Outlaws finished fourth with an even 3-3 record. Triple Play (CA), the default US National Champion, finished with a 2-4 mark. 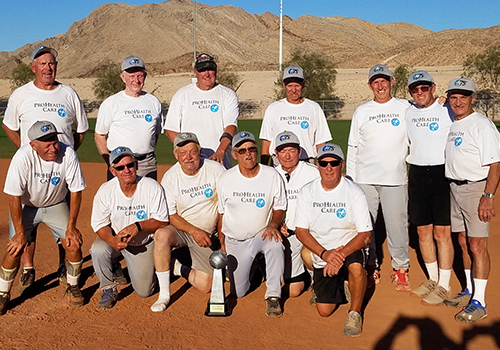 In the four-team Men’s 80 Platinum Division, Florida Investment Properties (Major Plus), posted a 3-0 record in seeding play to secure the top seed. 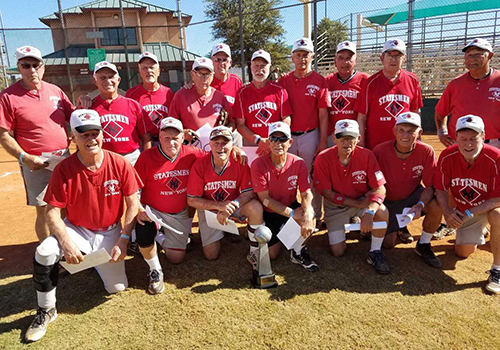 In bracket play, Florida Investment Properties posted a 4-1 record to win the championship. Florida Investment Properties started off bracket play with a 19-6 win over Top Gun Diamond (CA), before losing to Fairway Ford (CA), 21-19. 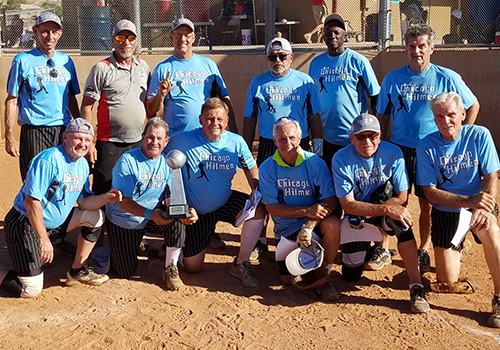 Florida Investment then eliminated LOTA Softball (AR), 20-9, in the third-place game to advance to the championship game, setting up a rematch with Fairway Ford. Florida Investment would get its revenge, scoring six runs in the bottom of the open to complete the 21-20 walk-off win and force the “if” game. The “if” game would be forfeited by Fairway Ford. As the highest finishing Men’s 80 Major team, Fairway Ford would also earn first place awards. A full eight-game round robin was used to determine the champion in the nine-team Men’s 80 AAA Division. Going undefeated at 8-0, New York Statesmen took the top prize. Sacramento Gold (CA), the default US National Champion, took second place with a 7-1 record, falling short of the Triple Grand Slam. Minnesota Legends finished third with a 6-2 record, while Scrap Iron Grey Berets (CO) finished fourth with a 5-3 mark. 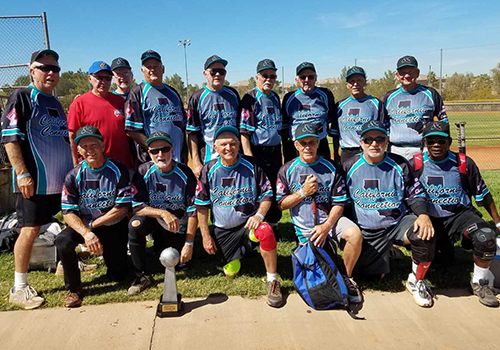 In the ultimate Senior Softball division, Center For Sight (FL) completed a perfect week, going 4-0 in seeding play, and 2-0 in bracket play, including a 12-6 win over Arizona Prospectors in the championship game, to win the five-team Men’s 85 Major Division. For Center For Sight, this marks the team’s second straight World Masters Championship win. Southwest Stars (TX) and Legends 85s/ProHealth (MN) tied for third place in the modified single elimination bracket. The five teams in the Men’s 85 Division set a new record. The division made its debut during the 2014 season with three teams. Center For Sight also took home the title that season.